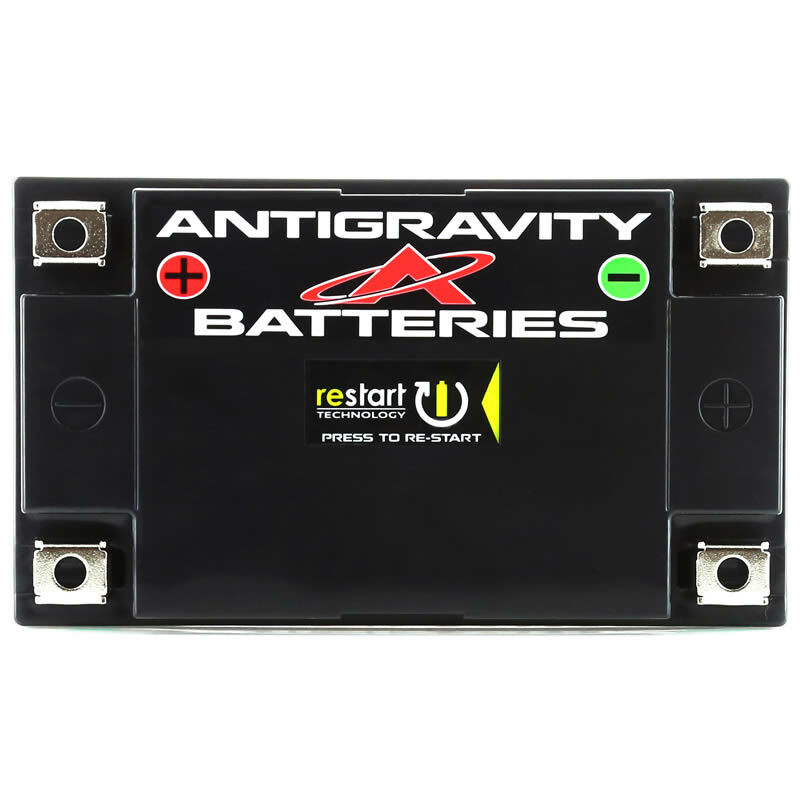 The NEW Antigravity AT12-BS-RS battery is built with our groundbreaking RESTART Technology (built-in jump-starting) so you won’t ever get stranded with a dead battery again! The AT12BS-RS is a hi-power, lightweight Lithium-Ion battery that directly replaces the OEM Lead/Acid YT12-BS and comes in a Heavy Duty version also. 360 CA, 12 Ah (Pb Eq). Never again worry about getting stranded with a dead battery! 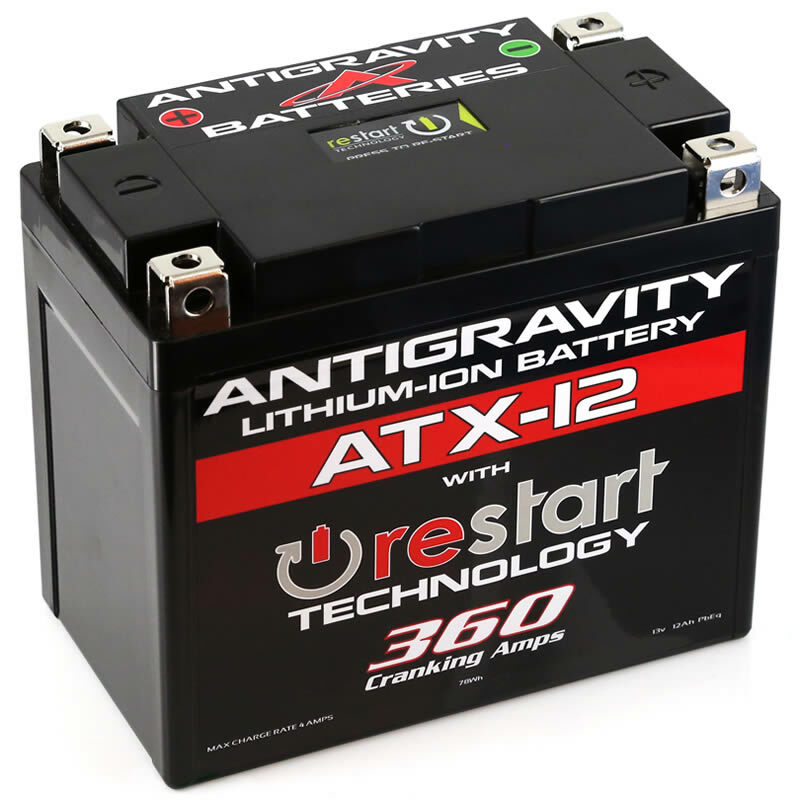 Antigravity Batteries introduces the groundbreaking “RE-START (RS)” line of batteries – the first batteries with built-in jump starting! The revolutionary AT12-BS-RS RE-START Battery intelligently monitors its status, and just before going completely dead puts itself to sleep with just enough energy to get your vehicle started again. Simply press the RE-START button located on the battery, start your vehicle and drive away… No more dead battery emergencies or being stranded! 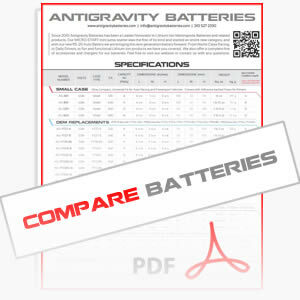 The new AT-12-BS-RS is an extremely lightweight and high-power Lithium-Ion replacement battery for the heavy lead/acid YT12-BS battery found in many Motorcycles and Powersport Vehicles. The AT12-BS-RS offers the first FULL Battery Management System (BMS) found on a Powersport Battery and includes low-voltage cut-off, over discharge, over-charge, and thermal protections with real time lithium-ion cell balancing. The new AT12-BS-RS also comes in a HEAVY DUTY VERSION for those requiring more Capacity and Power (AT12-BS-HD-RS). Excellent for every day use in stock bikes up to 1300cc. For Race Vehicles up to 1600cc.